In this lesson, we will learn how to identify and use parts of a circle, such as the radius, chord, and diameter, to solve problems. Find the length of 𝑀 𝑁 . Given that 𝐴 𝐵 = 4 2 c m and 𝐸 𝐶 = 1 0 c m in the two concentric circles shown below, find the length of 𝐴 𝐶 . Suppose 𝐴 𝐵 = 1 3 2 c m , 𝑀 𝐷 = 4 4 . 5 c m , and 𝑀 𝐸 = 2 6 . 7 c m . What is the length of 𝐵 𝐷 ? Are all the radii of a circle equal in length? Is the diameter the longest chord in a circle? The length of the radius of a circle is the length of its diameter. What is the name of a chord that passes through the centre of a circle? Which of the following correctly defines a circle? AA circle is the set of points in a plane that are the same distance from the a given point called the center. BA circle is the set of points in a plane that are different distances away from the center. CA circle is the set of points in a plane that does not have any lines of symmetry. DA circle is the set of points in a plane with a limited number of sides. EA circle is the set of points in a plane with a single curved side. In the given figure, which of the following would represent the chord passing through 𝐵 and 𝐶 ? Identify the radii of the circle. Identify the diameter of this circle. Given that 𝐴 𝐵 = 9 3 c m , find the radius to the circle 𝑀 . If the length of diameter 𝐴 𝐵 of circle 𝑀 is 158 cm, find the radius of the circle. Determine the diameter of the circle 𝑀 , given that its radius 𝐴 𝑀 = 4 9 c m .
What is the radius of a circle whose diameter is 18? What is the diameter of a circle whose radius is 3? 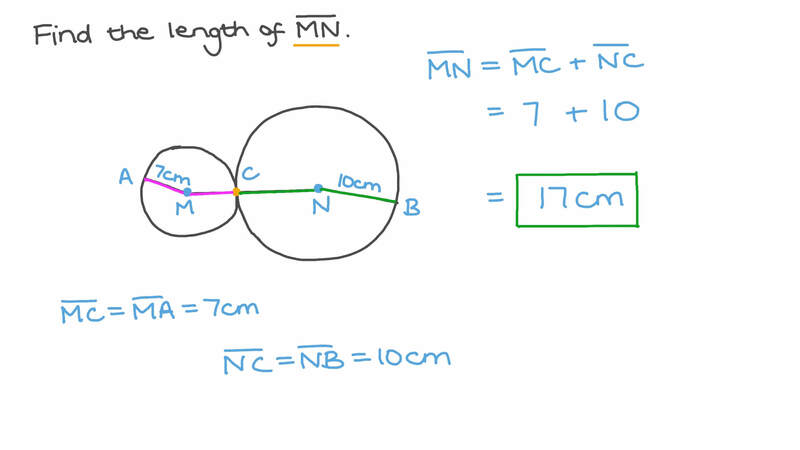 If the diameters of circles and are 2 cm and 6 cm, respectively, determine the length of . Circles 𝑀 and 𝑁 are of radii 11 and 18 and touch internally. Determine 𝑀 𝑁 . What is the name for any line segment in a circle whose endpoints intersect the circle? If the length of the longest chord in a circle is 310 cm, what is its radius? Chords 𝐴 𝐵 and 𝐶 𝐷 meet at 𝐸 . If the lengths 𝐴 𝐸 , 𝐵 𝐸 , and 𝐶 𝐷 are 5, 6.4, and 12 respectively, what are the possible values for 𝐸 𝐶 ? Determine the chord(s) of the circle shown below. In the figure, 𝑀 𝐴 = 3 4 c m . Determine the length of 𝐶 𝐸 . What is the longest segment with endpoints on a circle of radius 66.9 cm?